I know this may come as a shock to you, but Suit757 is no slave to trendiness. Tivo, Snookie, Twitter. Don’t have a clue. I may have yet to send my first text message, but I’ll gladly embrace a trend that makes sense. Like the latest craze sweeping America. No. Not some new reality TV show. I’m talking about “the gastropub”. Let me tell you, I LOVE gastropubs! The term “gastropub” was coined exactly 20 years ago at the Eagle Pub in London when a couple of uncharacteristically inventive Brits decided that it would be a real novelty to serve something other than pretzels and warm beer. The idea has evolved over the past decade into what can only be described as the absolute definition of heaven for Suit757. 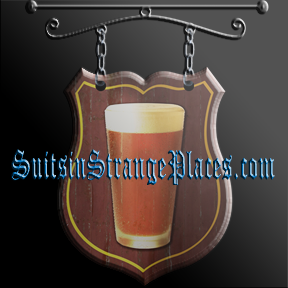 A pub with extraordinarily good beer selection that serves over the top delicious gourmet bar food. Of course, here in America, all fads and trends start on the coasts. Whether it is oxygen bars, butterfly tattoos or carbon footprint guilt, you know it had to start in Los Angeles, San Francisco, New York or Boston. Thankfully, most of these trends crumble under the weight of their own stupidity and never make it to flyover country. That’s why I was so excited when a fellow suit of mine recommended Republic Gastropub in Oklahoma City. Folks, if a trend makes it all the way to Oklahoma, it’s no longer a trend. When you can find a gastropub pub smack dab in the middle of the North American continent, you can be confident that good food and drink are here to stay. Sell your stock in Applebees now! I knew this was going to be a different experience the moment I pulled up to the Republic Gastropub. I thought I was lost in some modern architecture Frank Lloyd Wright strip mall. Like I was transported into some futuristic science fiction artist’s rendition of a colony on Mars. I am in Oklahoma, aren’t I? But you know what? The place was packed. On a Wednesday night. I grabbed the last seat at the huge wrap-around bar between some rich retiree and another dude scamming on a brunette who mysteriously had the flawless face of a 30 year old and the bony, wrinkled hands of a 60 year old. The crowd was made up of mostly older guys who looked like they could afford ten dollar gourmet burgers and six dollar microbrews, interspersed with a nice contingent of former Oklahoma beauty queens looking for love. From the looks of these ladies, plastic surgeons, hair dressers and Merle Norman Cosmetic Studio owners do very well in Oklahoma City. Hey, I’ve always said Oklahoma’s considerably pleasing aesthetics is one of the reasons to look forward to a trip to the Sooner State. Now I have one more. Republic Gastropub has a mind-boggling beer selection. Try 999! Or something close to it. From floor to ceiling, row after row of exotic microbrews from every corner of the world. Even better yet, over 100 taps of fresh microbrewed beer from all over Mid-America and beyond. So many choices! How do you even begin to make a decision? Well, call it dumb luck, but I hit the jackpot on my very first draft, Tallgrass Oasis ESB, brewed in Manhattan, Kansas. “ESB” is a British term that stands for “Extra Special Bitter”, which supposedly means it is slightly less lame than a typical British bitter. Let me tell you, there was nothing lame (or British) about this Kansas microbrew. Hoppy, powerful, flavorful, this is one manly brew for true beer lovers! Lots of hops. Lots of malt. Lots of alcohol. And lots to like about this beer. Always in search of something just a bit different, my next brew was a “Black IPA” called Laughing Dog Dogzilla out of Sand Point, Idaho. Black IPAs are a novelty. Kind of like black Republicans. Most IPAs are pale in color – that’s what the “P” in IPA stands for. Duh. But this one uses dark roasted malt to give it a strong balance to all the hops. About halfway through my Dogzilla, I got my “Republic Burger”. If you are still not sure what a gastropub is (other than good beer selection), you are about to find out. Gastropubs serve fairly typical bar food (think burgers, fish & chips and nachos) but with a spectacular, gourmet, high-end flair. For example, my Republic Burger came topped with a relish of apple wood smoked bacon and carmalized onions, a cheese blend of bleu and gruyere, a garnish of arugula, a zesty remoulade spread and a fried egg all served on a gourmet pretzel roll. How’s that for over the top? It’s absolutely delicious. That’s how it is. Of course the fried egg is the pièce de résistance. If you’ve never tried a big juicy burger topped with a fried egg, you haven’t lived yet. The egg adds luxurious richness and decadence to man’s greatest invention – the hamburger. Somewhat surprisingly, all those competing flavors worked well together on the Republic Burger. While over the top to be sure, it all held together surprisingly – and deliciously well. On the side I ordered a macaroni and cheese dish studded with pieces of bratwurst and covered in bread crumbs. Good, but it needed to come out of the kitchen above room temperature. To wash down the last few bites of my gourmet pub food, I ordered a local beer, Coop Gran Sport Porter, brewed right here in OKC. It was a tough act to follow all that extraordinary beer and food, but the local porter didn’t disappoint. Nutty and smoky, it packed more a flavorful punch than a typical porter. You know what? I’ve finally found a trend I can embrace. Smoky porters from Oklahoma. Black IPAs from Idaho. Egg topped burgers. And I don’t have to fly to LA to get them. I’ll drink to that.